Designed by engineer Robert M. Schwartz in 1949, the shells, in addition to being larger than anything the US military had ever produced before, had to have a case some 4000 times stronger than that of the aforementioned bomb dropped on Hiroshima in order for the nuke to survive the extreme forces it would be subjected to when the weapon was fired. While you might think designing such an round would be insanely difficult, if not wholly impossible, Schwartz reportedly had a working rough design ready in just 15 days. The resulting W9 was essentially an 850 pound, 11 by 55 inch shell with a gun type nuclear tip capable of producing a 15 kiloton blast. Of course, there was also the problem of the U.S. not then having a cannon capable of firing these W9 shells. Schwartz solved this too, drawing inspiration for the ultimate design of the M65 from German WW2-era railway cannons like the Krupp K5. He also designed the M65 such that it could be transported via roads, hugely increasing the weapon’s utility over railway cannons. That said, to say the M65 was cumbersome is a massive understatement. Weighing around 83 tons tons, it was rather difficult to move, requiring two trucks packing 375 horsepower engines, one truck on each end of the cannon, with the drivers needing to be in constant communication as they drove. The top speed on this setup was a breakneck 35 mph, if the road was straight and reasonably flat. 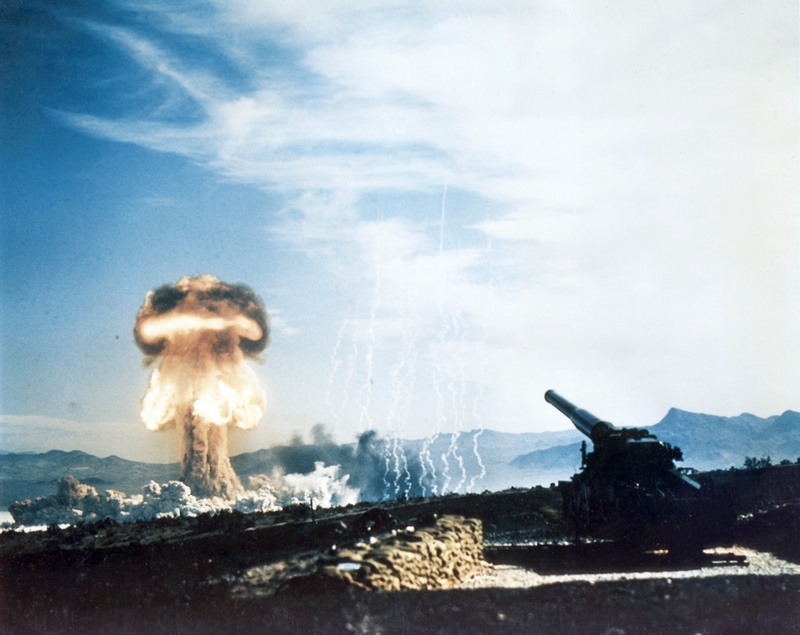 As alluded to earlier, the M65 is known to have only been fired once, as part of Operation Upshot–Knothole, a series of nuclear weapons tests conducted at the Nevada National Security Site in 1953. In the one and only time a nuclear bomb has been shot from a cannon, during the Grable test at Frenchman Flat, the nuke flew 10 kilometres (roughly 7 miles) through the air, where it exploded about 500 feet above the ground. The resulting explosion incinerated everything within about a mile of desert, excepting of course a lead lined fridge that was thrown free, and released a shockwave of searing hot air that tore apart lightly armoured vehicles positioned at set distances from the target area- all while several thousand soldiers, hundreds of military officials, several members of congress and then Secretary of Defence, Charles Wilson, looked on in awe from a mere 10 miles away. Footage of this test was quickly circulated by the military as a show of force to the Soviets, and twenty M65 cannons were ordered to be created, all of which were shipped to Europe and South Korea where they spent around a decade being moved to various classified locations. However, with the combined advent of tactical nuclear missiles and smaller nuclear shells that could fit in more widely used 155mm and 203mm cannons, the M65, which debuted with a bang in 1953, quietly went the way of Dodo by 1963. I see what you did there, Indiana. I believe you got a hyuck out of me. Another attempt at nuclear artillery was the Davy Crockett recoilless rifle which could launch a tiny fission bomb a mile and be mounted on a jeep. This is why you plan your route, rookies. Sheesh, my typical rig is 97 feet long. As a truck driver, I have occasionally gotten myself into situations I couldn’t extract myself from without destroying some property. I will say that, I’ve never had to destroy even one building, though. Not a whole one, anyway. To be fair, you’re a truck driver,…. they are the military. Y’know what they say about military intelligence. As of a few years ago, one of these cannons was on display at Ft. Riley. It’s sitting on a hilltop that is visible from I-70. The original cannon that fired this round, “Atomic Annie,” is currently on display at the US Army Field Artillery School at Fort Sill, Oklahoma.